- Roth TL et al.은 바이러스 방식이 아닌 보다 안정적인 CRISPR Gene Editing을 이용한 T-cell engineering을 규명하였다. CRISPR/Cas9 gene editing은 효율적으로 knock-out mutation을 얻을 수 있지만, knock-in mutation은 보다 어렵다고 알려져 있다. 왜냐하면, Cas9-sgRNA ribonucleoprotein(RNP) 복합체와 함께 도입되어야 하는 donor repair template의 합성과 delivery가 보다 까다롭기 때문이다. Knock-in을 위한 Donor repair template의 경우 double-stranded DNA (dsDNA)에 비하여 single-stranded DNA (ssDNA) repair template가 보다 많은 이점이 있다고 알려져 있지만, long ssDNA donor template의 합성과 비용의 문제가 있었다. Guide-it™ Long ssDNA Production System은 CRISPR/Cas9 또는 그 외의 gene editing tool을 이용한 knock-in 실험을 위한 최장 5kb의 ssDNA repair template oligonucleotide를 합성할 수 있는 제품이다. 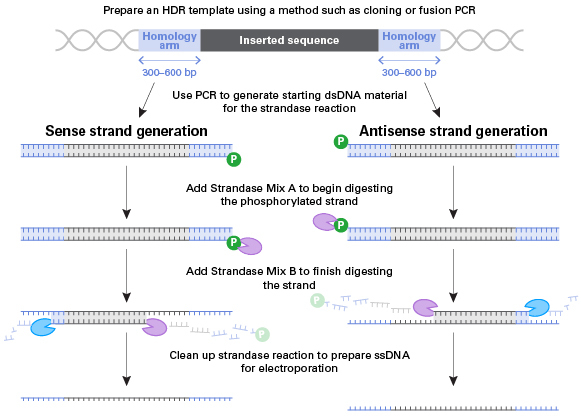 본 제품을 이용하면 “Strandase” 처리를 이용하는 간단한 방법으로 dsDNA PCR 산물을 sense 또는 antisense strand로 분리하여 ssDNA를 제작할 수 있다. Guide-it™ Long ssDNA Production System (Code 632644)은 Guide-it™ Long ssDNA Strandase Kit (Code 632645)과 ssDNA 정제용 NucleoSpin Gel and PCR Clean-Up으로 구성되어 있으며 50개의 ssDNA를 제작할 수 있다 (25 pairs of sense and antisense strands). 그림 1. Schematic describing the steps involved in the preparation of long ssDNA donors for use in HDR experiments. 그림 2. Screening for insertion-site mutagenesis in Cellartis human iPS cell line 18 (ChiPSC18). 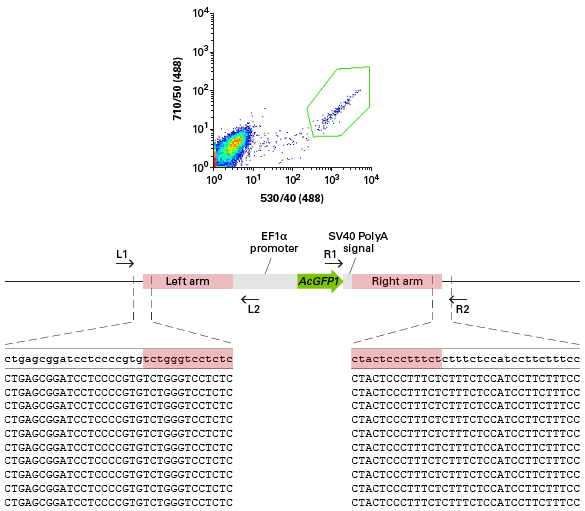 The DNA donor template containing AcGFP1 driven by the EF1-alpha promoter, had 600-bp homology arms with the target site in AAVS1. After isolating GFP-positive clones, the predicted insertion sites were sequenced to determine the insertion accuracy. We found that both the left and the right insertion sites had seamless integration in every clone tested. 그림 3. Production of ssDNA from a dsDNA template starting material. 그림 4. Comparison of cellular toxicity induced by dsDNA and ssDNA in Cellartis hiPSC18 cells during knockin experiments. Cells were electroporated with or without Cas9 and with either sense or anti-sense ssDNA or dsDNA donor templates designed to tag tubulin with AcGFP1. The donor templates were created with 350-bp homology arms to the insertion site and were 1.5 kb in length. As seen in the images, the dsDNA donor template caused significant toxicity when combined with or without Cas9. 그림 5. Knockin of AcGFP1 at the C-terminus of GAPDH in HEK293 cells. This experiment demonstrates the use of long ssDNA to tag an endogenous protein with a fluorophore. We designed a donor template with homology arms to the end of exon 8 of GAPDH such that AcGFP1 would fuse in-frame with GAPDH (Panel A). As shown by the flow cytometry data (Panel B), the use of linear dsDNA as a donor template results in a large number of green fluorescent cells even in the absence of Cas9 RNPs. However, by using the sense or the anti-sense long ssDNA donor templates, integration only occurred when the templates were delivered together with Cas9 and sgRNA. If the ssDNA donor template was delivered into cell in the absence of Cas9 RNPs, almost no background could be detected.